Point TV holds their annual film festival, the Glammy’s, at the end of every school year to showcase the work students have done over the course of the fall and spring semesters to friends, family, and faculty. The Glammy’s awards were held on April 26 from 7:30 to 9:00 p.m. in Salomon Theater on PLNU’s campus. Point TV has been hosting the TV and Film festival annually since 2004. Dr. Alan Hueth planned the film festival in 2004 originally to showcase PLNU’s first short film and has decided to continue every year since. 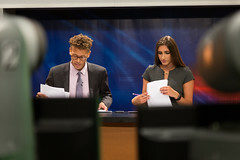 Over the years, Dr. Hueth has allowed more student involvement with the preparation of the Glammy’s by allowing the Point TV Station Manager to plan the festivities. The Spring 2018 Glammy’s were planned and prepared by Station Manager, Eliza Jason. 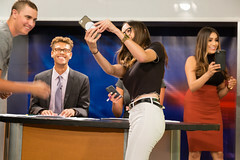 At the end of each festival, a number of awards are given out for students in different areas such as news, television, intro projects, film, as well as leadership and service. Some of the most prestigious awards given are also awarded by Professor Dr. Alan Hueth himself. Some of the awards given out include ‘Best Anchor” which was awarded to Broadcast Journalism senior at the time, Sophie Proctor. ‘Best Television Host’ was awarded to Media Communication Senior, Rio Gifford. The ‘Best Short Film Group Project’ for the intro to Television Production class was awarded to Media Communication majors, Javiera Vasquez, Isaiah Lundell, Henrique Din, and Danny Moore. ‘Best Film Director’ was awarded to Media Communication Senior at the time, Paige Adlhoch for her music video, Tribulation. Leaders of Point TV were also recognized for their hard work and leadership. The next Glammy’s will be held in April of 2019, which will showcase projects from this fall, and next spring, as well as additional awards for this year’s students. 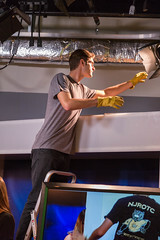 If you would like to see projects from our students, head over to http://www.youtube.com/pointtv to watch. October 24, 2018 in Uncategorized.